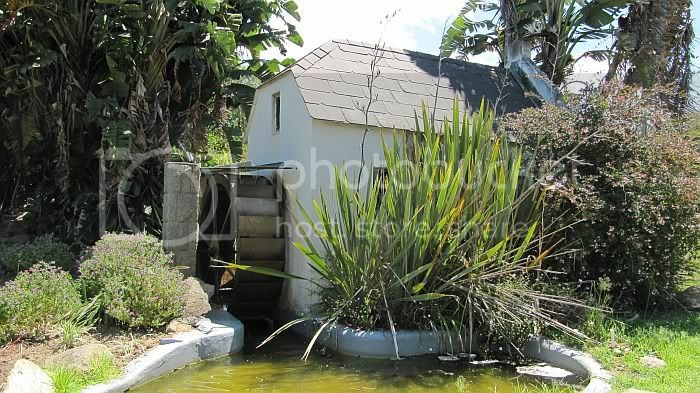 show us your waterwheels in your area. There is one just outside Bedford, en route to Adelaide. I am interested in old machinery. 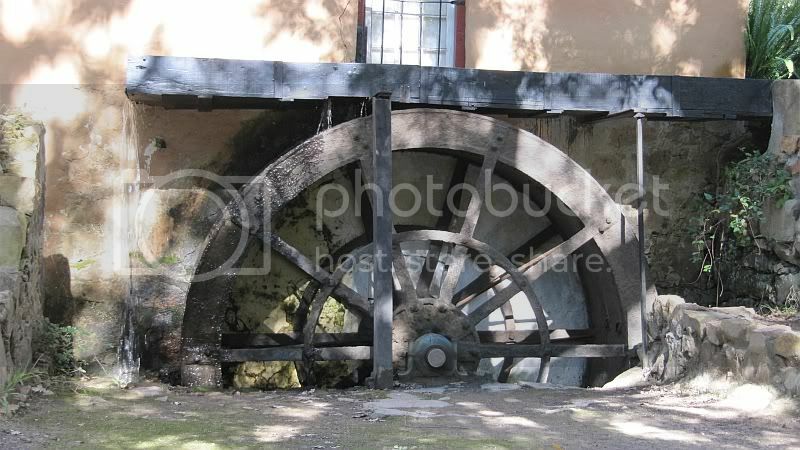 That is bigger than any waterwheel I have seen locally. Thanks for the heads up - I will visit it when next in the area. 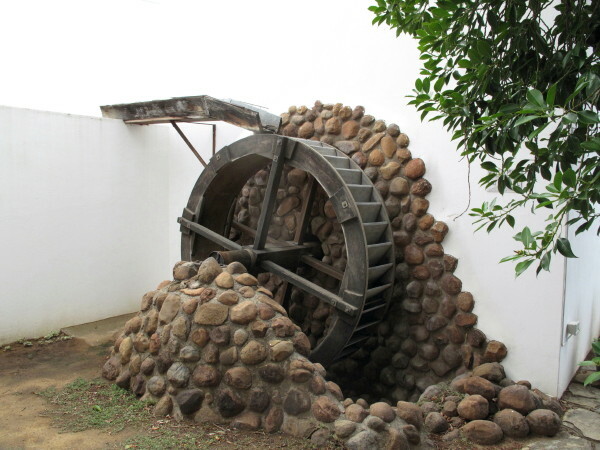 When I was a schoolboy (Paul Roos) there was a working waterwheel grinding wheat where the OK Bazaars is on the Dorp Street side of the Braak in Stellenbosch. There is also one in swellendam where we always stopped on the wat to cape town, was the halfway post. Mills bring back some memories for me, will go look for one to post here. This is an extract from of a very long ride report of mine. It is actually a replica and those stones look terrible. They did not have cement in those days and I hope they would have built something more handsome than that abortion. A waterwheel and mill are pretty simple machines. 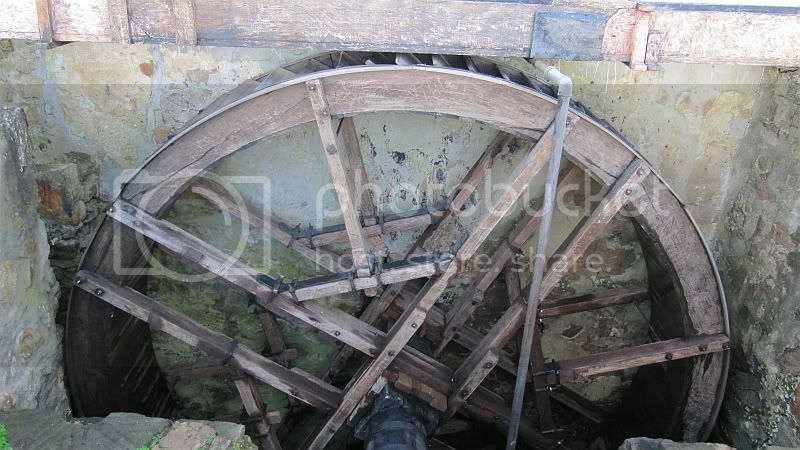 The waterwheel drives the square shaft at the back in the picture. 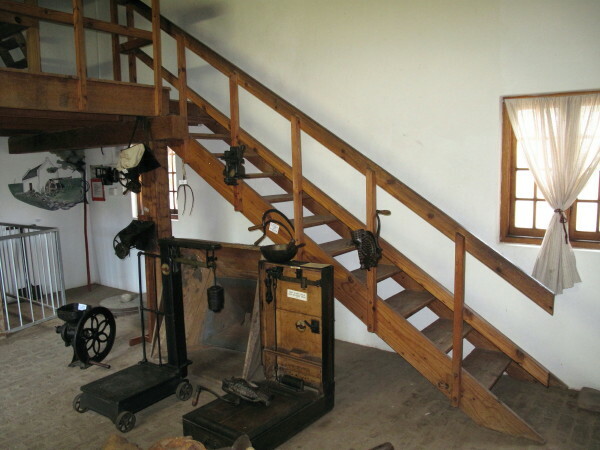 The large crown wheel has hard wood teeth driving the iron rods of the lantern pinion. Notice how worn the iron rods are but the wooden teeth still look new. The advantage of the wooden teeth is they could easily be made locally and replaced as they wore out. Cast iron may last longer but what happens if it wears or suffers an accident? 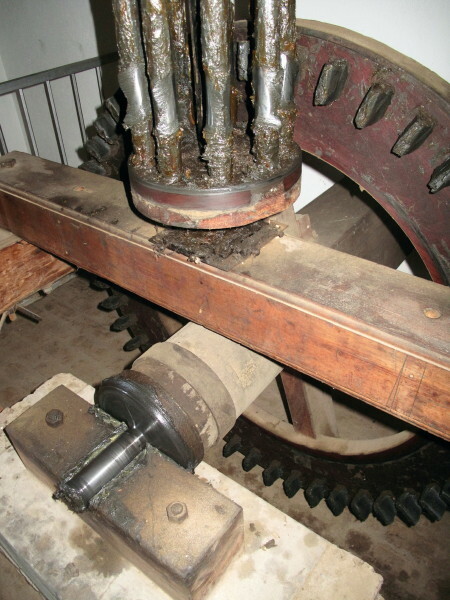 The grindstones are above driven directly by the pinion shaft (no more gearing to increase the speed). There is a hopper above for the wheat. Someone has to carry all the sacks of wheat up to the hopper; this lovely set of stairs is used. The rise and reach of the steps gives the easiest stairway to climb – much appreciated by that man I hope. If you go there try them yourself. I can also remember playing there as a kid; even then I was upset by it's removal to build the OK Bazaar. The wheel lay in the back garden of Grosvenor House for many years, near the statue of "Pienk Piet". There is one in Keimoes but I can not find my photos.Interesting town with all it's bridges. Outside Oranja.Can someone tell us what this is and used for please. Looks like it's made to drive something....maybe there's a shaft drive PTO type thing going somewhere? Can't be, it is still working. I would say it is some sort of scourer for infolw water in the channel. Lets see some of these in action with all the rain lately.